Simply put, it is a path that winds around within a circle. The path begins at the outside of the circle, and ends at the center. It is often confused with a maze. However, a maze has many possible paths, many of which terminate in dead ends. A labyrinth has only one path, and the only choices you can make are to continue walking, to cheat by jumping across, or to quit. It is a metaphor for the spiritual journey, or the inward journey, and when you walk it mindfully, you can experience many spiritual revelations about yourself, and your journey. 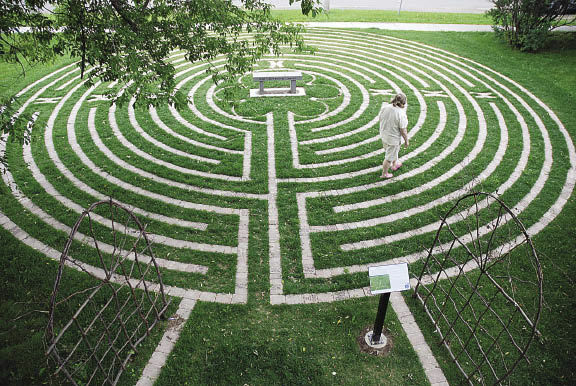 There is much more to know about labyrinths, and you can read about it further here if you like. One more interesting thing – the labyrinth can not be shrunken without losing it’s effect – it becomes too small to walk if it is made smaller. This makes it too large to have in your home, unless you have a room that has open space of about 45×45 feet! I began by taking my shoes off (required). The mental affect of taking my shoes off was calming, adding to the calm I already felt from the quietness and subdued lighting of the cathedral. Taking my shoes off made me feel at home, as if I could relax and be myself. As I walked, I began to experience my walk as a metaphor of my own journey, from my present, to my future destination. I took my steps slowly. In the very beginning of the path, I actually passed quite close to the center, but then the path weaved away from it. I thought, how much like my experiences – I often feel like I can be so close to becoming the person I want to be, only to realize that early growth on the spiritual path is just a taste of what is to come. I thought about the typical arrogance of those just starting out on the spiritual path – we have one really deep experience, and we think we have arrived, and are so much better than our compatriots. In the quiet, meditative atmosphere of the cathedral, it was easy to continue deeper into metaphorical thought about my journey. I found the corners to be difficult because of my knees. Every change of direction in my spiritual life takes effort – even when I know a change is coming, I often have difficulty – how much easier to go in a straight line! How much more concentration I needed to stay on the path! My friend Jason began walking the path behind me, and we passed one another, often quite closely, as we wound our way around the labyrinth. I thought to myself “I am ahead of him – I hope that he doesn’t overtake me.” I reflected on how I often think of spiritual growth as a contest against others – a competition. I thought about how foolish that was – especially since he would arrive at the end, just as I would – it was not a race at all. My job was to stay on the path and make sure I reached the end! I remembered how foolish it is to compare one’s self to others. I remembered that one of the most important measures of spiritual growth and maturity is love – quite the opposite of competition and one-upmanship. At certain points along the labyrinth, I realized that I could jump across paths to skip some of the path and “cheat”, getting closer to the end. One of the dangers of cheating by skipping across paths is that you often can’t tell which way is forward and which is backwards, and you may find yourself going the wrong way after cheating! I thought about how many times I had wished for a shortcut to spiritual maturity – and how only regular disciplines really make for real progress in spirituality. I thought about “cheating” spiritually, like trying to appear more knowledgeable in spiritual matters than we really are, or mistaking spiritual knowledge for spiritual depth, experience, and growth in perspective and kindness. I wondered at what I might miss if I skipped portions of the path, or about how my satisfaction in finishing might be robbed by my guilt and knowledge that I had cheated. I thought about the times in the past when I had cheated myself spiritually by not sticking to moral principle, rather than waiting to earn my way honestly. At times, I thought of rushing through, but I thought, here I am on vacation, having this incredible experience, why would I want to rush it? I realized that being on the path, and enjoying it, is as important as finishing. Why rush to the end when you can enjoy every part of it? It made me want to enjoy each of my days as much as possible, rather than rushing through them. At a couple points, especially near the end, I found myself at the very outer edge of the circle – at the point farthest from my goal. Even though I had walked for ten minutes already, it appeared that I was no closer to the endpoint. I realized that this is often the case in spiritual growth – when the toughest breakthrough is about to happen, I often feel the darkest and farthest away. I want to give up because it looks like I’ve made no progress, or as if I’m worse off than when I started! The only thing that kept me going was the knowledge that I MUST be closer because I had not cheated, and had traveled along the prescribed route. Finally, arriving at the center, I continued to listen to what the labyrinth had to teach me. I stood off to the side in one of the petals of the flower, and wondered if there was an order to them – would I stand in the “first place” petal? I thought back to my realizations about competition, and realized that in a flower, the petals go all around, so every petal is equal. I looked up and saw the light far up in the ceiling. I thought to myself, “this is the real goal of the spiritual journey – the journey towards God.” I stood there for five minutes basking in the fact that I had finished. Afterwards, I sat down while Jason finished, and let the whole experience wash over me in the quiet echoes of the cathedral. I noticed that he was at the labyrinth’s center, and was looking at the altar at the front of the church – I hadn’t even thought to look up there – and I realized that I have a remaining disdain for formalized religion, and don’t even think of God as being up at the altar, but rather, straight up into the sky. So be it.